Kevin Wilkin’s side recorded a fifth straight win to beat Kidderminster Harriers 3-1 at St James Park on Saturday. Saints started strongly, taking a fourth minute lead and should have taken a bigger lead into the half-time break but instead were pegged back by the visitors before two second half goals sealed the three points. Jimmy Armson’s 13th league goal of the season put his side in front, a fine volley after a sustained spell of early pressure. Ellis Myles rifled in a shot that was deflected narrowly wide and Carl Baker worked an opening only to see his fierce effort just clear Brandon Hall’s bar as Saints dominated possession but could not capitalise on their chances to extend the lead. 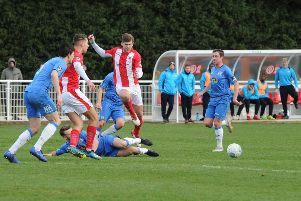 In a rare Harriers attack, Joe Ironside was fouled winning a penalty that he got himself got up to convert in the 38th minute against the run of play. The equaliser stunned the home side and it was not until the second period that their lead was established again. Baker’s 71st minute corner was headed powerfully goal-wards by defender Connor Hall for Lee Ndlovu to apply the finishing touch for the striker’s 20th goal of the season. 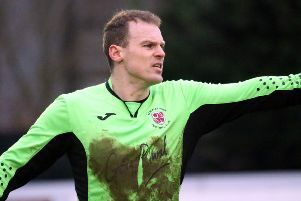 Seven minutes later substitute Luke Fairlamb was brought down and Shane Byrne fired in the resulting penalty to put the result beyond doubt.